Heading out for a game on the road? These tips will help maintain your equipment. Making the decision to join a travel league is all about challenging your skills, and elevating your game. It’s also a challenge to haul all your soccer equipment with you on planes, in vans or on buses. It’s not easy, and caring for your equipment while on the road is crucial if you don’t want to make yearly replacements. Here are some tips on how to pack, how to care for and how to keep track of your equipment. The first step is to gather everything you need, and to carefully pack it into your bag. It’s important to do this right the first time, as you’re not going to want to take the time to carefully re-pack your bag after a game or practice session. Most soccer bags have pockets for everything, so check the manual (or sometimes just the tag) on your pack to see what goes where. The stuff you use most should be easily accessible so you can quickly pack and go when you need to. Make sure, especially if you travel by plane, that you have a space for your travel documents as well. The most important step in caring for soccer apparel is to properly wash your clothes and care for your shoes. Most leather cleats have some kind of cleaning solution that softens and strengthens the leather, while acting as a cleaning agent to reduce odor and keep shoes looking nice. If you played on grass recently, make sure you take the time to knock off all the caked dirt that’s accumulated on your cleats to keep your jersey and clothes clean when you re-pack. Do the maintenance before you leave for your game, and again when you return. Don’t take up valuable space in your bag with leather conditioner you’re probably not going to use. However, you’ll want to reconsider that if you’re on the road for more than a week at a time. The hardest part of travel is keeping track of your equipment as you’re out and about. 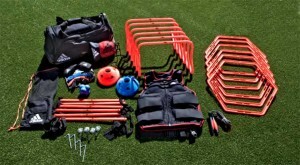 The simplest solution is to continue to pack your supplies after every game. Develop a system for yourself, and keep a checklist near your pack at home so you know what needs to be in there. Eventually, this stuff will be committed to memory but it’s helpful to give yourself some kind of guide.